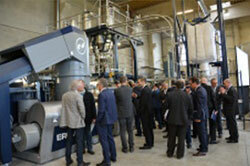 Austrian recycling equipment maker Erema recently opened its UpCentre in Gunskirchen (not far from the comapny's headquarters in Ansfelden, Austria). With its UpCentre, the company says it has opened the doors to a whole new form of upcycling service which means that customers now have Corema technology for the sampling of recycling compounds at their disposal. It invested EUR2 million in the centre. Robert Obermayr, Corema Product Manager, explains: "On the way from recyclates to made-to-measure recycling compounds you need a lot of fine tuning in practice: processors demand varying quantities of samples – as often and as long as necessary until the recycling compound meets the exact requirements of their concrete application, such as film or injection moulding parts." 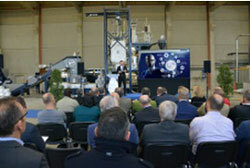 He also added that customers can now take advantage of the UpCentre to produce sample amounts in tonnes quickly and flexibly. “They benefit additionally from the process engineering know-how of Erema and Coperion – two global market leaders in their fields.” The UpCentre features a Corema 1108 T for a maximum monthly production of 500 tonnes. To enable these recyclates to be used 1:1 as a substitute for virgin material they have to have exactly specified, customised property profiles. Processors are interested above all in the recycled pellets allowing trouble-free further processing and the assurance of the functional characteristics of the end products produced from them. Erema says it became aware of this development years ago. With its Corema product line, Erema says it has combined all benefits of recycling and compounding in a single processing step for the first time in 2012. The company has now taken the next step forward with its UpCentre. For exactly specified raw material based on recyclate to feature more and more in the marketplace the right recycling technologies and, intense communication throughout the entire value added chain are required, adds Erema.